I sometimes think London is my Narnia, I've never really lived there (a brief year in Croydon in the 90s), yet have always run there or escaped there, as a place where I belong. But like Narnia its a place where I can't ever stay; there's always the familiar lamp post in the forest, and the exit back through the wardrobe to wherever it is I've come from. A lot of talk this week about London bucking the national trend and not voting UKIP along with the rest of the country. I can't help thinking that a place that has its own government, its own figurehead of fun, and therefore its own counterbalance to national politics might have no need for another one; besides the complaint about politics being London-centric and a metropolitan elite, means that we're talking about the capital with a mix of anger and envy. I think the anger and envy comes through when you go down these days. Not just the £80 fare, on a three quarter empty train, but that when you get there, flung into the maelstrom of this busiest of cities, you can't help but be impressed by the transport, at least since the Olympics, and at least compared with the rest of the country. As well as the Tube and trains, with you never having to wait more than a couple of minutes, there's the buses with their bus stop displays and their regular announcements at stops. If London can do this - and have a joined up service that means you can get from any one place to another without buying a myriad of tickets - then surely it should be possible elsewhere? And that meant that even though the gig was at Café Oto in Dalston, an inner north-east suburb I've never been to, I never had the same qualms I might have about going to and from a gig anywhere outside the centre of Manchester. Or, when we get there, finding an excellent Turkish restaurant on Dalston high street. There's never any impediment to spending money in London, of course, so no wonder the economy booms at the expense of the rest of the country. Still, it was gratifying to see a sellout at an experimental noise trios performance even if one of the three is Sonic Youth legend Thurston Moore. Playing alongside drummer Alex Neilson and bassist John Edwards, there was standing room only at the back, as we jostled to find a good view of the stage as the three came on to do the first of two excellent sets of improvisational music. In many ways this is as far from rock music as it gets. Its the impossible sounds that Edwards gets out of his bass that dominate, with Moore's guitar as much about texture as lead, and with Neilson's rhythm-denying drumming creating a strangely powerful thread on which to hang their improvisations. If it occasionally slipped into passages that lacked sonic definition, generally they worked impressively together, and the sound - like the Magic Band playing with Ornette Coleman - was as equally likely to surprise and astonish. Watching the three musicians take it out on their instruments was in itself mesmerising, yet whilst ignoring anything as mainstream as melody or rhythm, they somehow compensated with an often brutal, occasionally beautiful dynamic which I can honestly say sounded like nothing I've ever heard. During the break we spilled out of the hot venue onto the pavement - Dalston definitely approaching peak beard at a gig like this - and stood just a few feet from the musicians who passed the time with the London noise crowd. I finished the evening at a quiet cocktail bar in Islington. I'd popped into the comics exhibition at the British Library on the Friday after getting off my train - not perhaps the most coherent of their shows, it did, as ever, showcase things I'd never seen or heard of. Interesting that "comics" or "cartoons" have such a long history of satirical opposition; and also that they have been so often - but especially in the eighties and nineties - been a radical or subversive medium. I don't remember "Crisis", which seemed an incredibly interesting magazine, and was surprised to see depite a few references to Viz, no mention of the iconoclastic Oink! 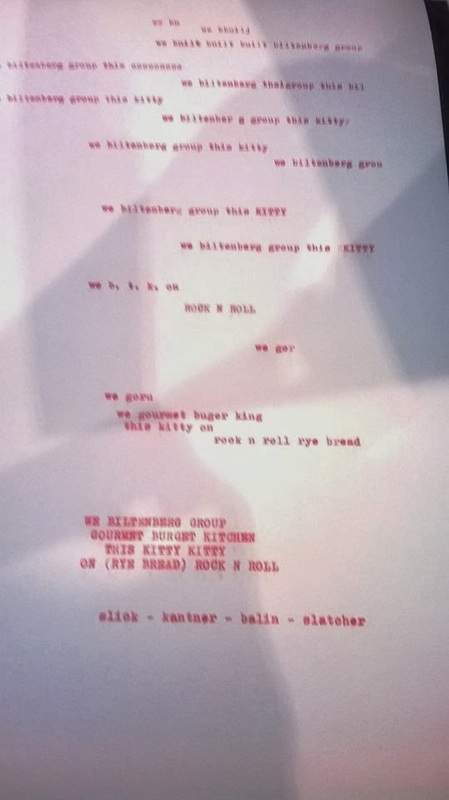 Inevitably, Alan Moore, Grant Morrison, Dave Mckean, Jamie Hewlett and others dominate - after all they're among the leading cultural creators of the last thirty years - and it was fascinating to see some typed out "scripts" for "V for Vendetta" for instance. I did ponder over the final room where the exhibition designers seem to have let form over content dominate a little - with some odd displays, amongst an endless number of V for Vendetta masked dummies, and, puzzlingly, a nod to Alestair Crowley because of his influence on the work of certain comic writers, "some of whom were also magicians." The British Library does this kind of thing well, but occasionally gets caught up in it own collection, I think. Saturday saw me scanning Time Out for exhibitions. Checking the Tate website on my phone meant that I ended up going to the wrong Tate for the Richard Hamilton exhibition (their insistence on a single "Tate Website" means that you get well confused where things are) which was having a final weekend at Tate Modern. No mind, we ended up looking round the free exhibition at Tate Britain, which included a "through the decades" look at British art. Its collection is astonishing of course, and there were a couple of my favourite Jacob Epstein's as well as one I'd not seen before; as well as much more modern stuff. The more recent acquisitions felt weak, derivative and somewhat random compared to what had come before, and going backwards through time, it felt like the fifties and sixties was the high water mark for British art. Late lunch at Wahaca, the Mexican street food restaurants that might be enough to make me move to London, regardless of anything else, and then the train back to Manchester - with, inevitably, a 45 minute delay because of problems with the overhead power lines. 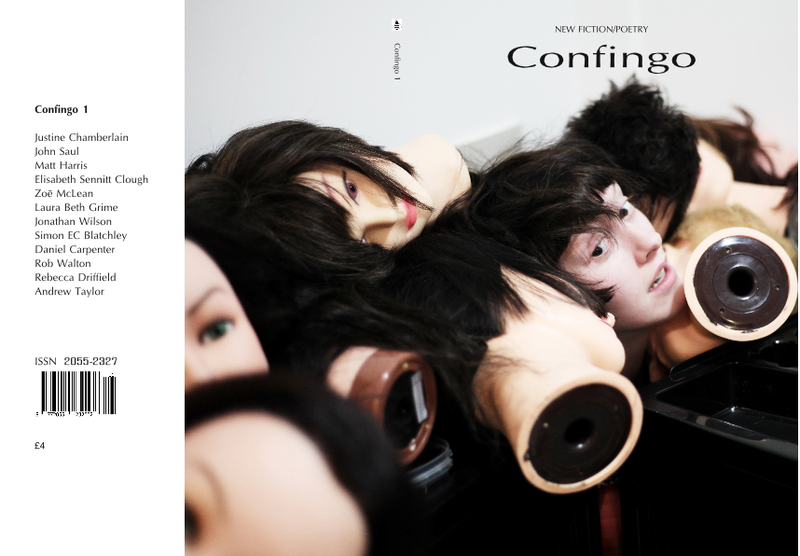 Met the editor of Confingo Magazine, for a drink last night, and he reminded me that issue 2 of his handsome looking new magazine is now available for submissions, and you can buy it online or currently in the Cornerhouse in Manchester. Mostly, new fiction, but with a few poems, and some arresting photography, it will come out twice a year. A cutprice PDF copy is now also available. Subscribe, submit. In other news, the St. Ann's Book Market, one of the highlights of Manchester's literary calendar is back, and for the first time, in a weather-proof tent as part of the city's spring independent markets programme. I will be reading some poetry there again on Saturday 7th June between 3 and 4pm. Lots of good and varied readers from the NW and beyond, with the host with the most, Gerry Potter, acting once again as Master of Ceremonies. There's a great playlist of past performances on YouTube here. But more than just readings you get a chance to browse a range of book stalls run by independent publishers, always an eclectic mix of the kind of books and magazines you can't always find in the shops or even online. The book market runs all that weekend. That "Star Wars" inspired a radio series called "I've never seen Star Wars" indicates that it is one of the cultural phenomenon which is expected to be near ubiquitous. Yet, there's another way to think about the film: that I've never really seen "StarWars." What I mean by this is that for those of us who were kids when the film came out and queued to see it at one of our provincial cinemas, uncomprehending parents in attendance, its almost impossible to think of "Star Wars" as just a film - without all the other stuff around it: the sequels; the prequels; the Star Wars Universe; LEGO Star Wars; the memorabilia etc. etc. So when I saw "Star Wars" was on television on Sunday night (albeit under its "new" name "Episode IV: A New Hope") I watched it, not just as a film, but as the place where the franchise started, before all that other stuff. Ironically, of all the "Star Wars" movies its probably the one I've seen all the way through the least times. "Empire Strike Backs" I caught last year; "Return of the Jedi" I seemed to see every time it came on television; whilst the prequels I've somehow caught part of whenever I've had a nephew in the neighbourhood. Yet its probably a decade or more since I last saw "Star Wars" and I'm not even sure I'd ever seen the remastered versions - I'm pretty sure this one was one of those - there were a few bits I just didn't remember, unnecessary scenes mainly. The film starts in familiar fashion, with that brilliant prologue, as the titles disappear into the screen - has ever a film been so recognisable through its typography? For this is a space movie set in the past - a future past, or past future. Before cyberpunk or steampunk there was "Star Wars" odd melding of nostalgia with technology. What surprised me was how little dialogue is in the first half hour of the film, and how little actors feature. For the first half hour or so we have stormtroopers, droids, spaceships, and various Muppet-like inhabitants of sandy Tatooine, with just a few seconds of Princess Leia, and then a few sparse scenes with Luke and his aunt and uncle. The start must have seemed strange in the extreme to those audiences in 1977, yet we are immediately into a piece of mythic storytelling - we have arrived mid-story - not just in the "Episode IV" but in the middle of an escape flight. Darth Vader's arrival on Leia's ship is an interruption, and she has the wherewithal to send her droids to finish her mission. For Leia is searching for Obi Wan Kenobi "the last" Jedi, who she feels will be able to do something with the plans of the Empire's new battle station, the ominous planet-sized Death Star. The first words are from the camp hospitality robot C3P0, "We're doomed..." he says echoing Dad's Army - and one notices how many of the accents are English. The Empire's war council are dressed like the Nazi high command but speak in RP. There's some great storytelling in this first "Star Wars" movie. Little touches like the pod being released having no human life forms on it, gives a bit more time to R2D2 and C3P0. Yet the look of the film, nearly forty years on, is still impressive. There's a darkness about the interiors that is classic spaceship décor - not so different than Lucas's debut film THX-1138 or other 70s SF. It did for British TV SF like "Dr. Who". These were believable spaceships, live action monsters, rather than men in monster suits (though Chewbacca carries on that tradition), and, most impressive of all - the light sabres are still the coolest looking weapon you could ever have. The cinematography throughout is great, but its also got that slow, clipped storytelling of so many great seventies movies, where scenes snap into the next one, yet there's a seamlessness to it that makes use of the big screen. TV this isn't. Part of the grandeur is in the detail. The monsters are still believable, but so are the human stars. Cleanshaven Luke and Han seem less dated than most heroes of that period, even if the first looks like a Lief Garrett at times. Its strange that Mark Hammill wasn't ever a bigger star: the camera loves him at times. Part of this power is the operatic nature of the story, where John Williams' music comes into its own. There's a lovely bit, I noticed, when we first see Luke, not a big entrance, but just helping his uncle buy a couple of droids at the market, and there's the basic "Star Wars" theme played over the top, not the fully orchestrated one, but just the theme, indicating the appearance of someone special. Similarly, "the Force", that strange magical power that gives the Jedi its power is introduced so subtley as you hardly notice. We see Luke fighting with a training robot, and Han Solo ridicules the idea of such a thing. Yet if the film really works on a human level its because this "band of brothers/sisters" comes together to have an unbreakable bond. I remember the somewhat "will they? won't they?" between Luke and Leia, but its pretty chaste even here - whereas Han's libido is larger than life. "Star Wars" gets by on big emotions, and big action scenes, but they are ably handled. Even slightly creaky machinations, such as the scenes when they are inside the "Death Star" are handled adeptly. I wondered why Obi Wan Kenobi says that if he is beaten he will come back stronger, and then he waits to let Luke see him beaten by Darth Vader. It is the passing on of the baton - this is their destiny. Aware that their ship is bugged they nonetheless go on to the rebel base for a final showdown, luring the Death Star to them, having seen it already destroy one planet. This death or glory part of the story is exciting but feels a little overdone now - we've seen so many space flight movies with acts of derring do. Mind you, isn't the dropping of the bombs on the Death Star an echo of the Dambusters? Darth Vader lives to fight another day, but his character is hardly drawn here: yet its quite powerful when he first appears, not speaking but breathing raspily. We'll have to wait another five films before we see how Vader becomes Vader. It was better I think not to know. Most of all, I was struck by the film being a standalone one. In the 70s sequels were just second rate cash ins, usually done at low cost and often without the cast of the original, trading on the name - but this film, though it already has a sense of its own mythical universe was stand alone for a few years. Lucas was waiting for technology to catch up, to enable the second and third films to take leaps forward in their spectacle, if not necessarily in their content. "Empire Strikes Back" is generally seen as the best of the bunch, though its always suffered because of being bookended by the films before and after. "Star Wars" I was remembered used to exist on its own without the universe that grew inevitably around its massive success. Its a wonderful movie. I was at "Sounds from the Other City", the multi-venue Salford music festival yesterday, which is ten years old. At Islington Mill at the end of the evening there was a DJ set from ten years ago. Music is such a reminder of a time; though given that I was 37 at that time, and probably less involved in music than I've ever been, it felt like I was trespassing on someone else's memories. Yet the "noughties" hasn't got the same sense of itself than earlier decades - perhaps it will come, but the "forever now" of the internet means that even the music of a particular time doesn't necessarily linger in that decade, like in the past. Yet its strange to think that bands like LCD Soundsystem or MGMT can now be seen as nostalgic. Yet if music always has a resonance, I wonder about poetry. What are the poems that have made an impact since 2000 - even amongst the cognoscenti? I can remember, outside of poet-friends, perhaps half a dozen. A couple of prize winners, Helen Dunmore's The Malarkey, Don Paterson's Love Poem for Natalie Beridze, the best poems from acclaimed books, Daljit Nagra's Kabba Questions the Ontology of Representation, the catch 22 for "black" writers or Luke Kennard's The Murderer then there's Mel Nicholls' unbeatable piece of Flarf, I Google Myself, or Tom Jenks' 99 Names for Small Dogs. Also, there have been some stunning books/sequences such as Chris McCabe's Shad Thames, Broken Wharf, George Szirtes' The Burning of the Books or C.D.Wright's One Big Self. Perhaps the most memorable phrase of 21st century is also one of its least lyrical, Andrew Motion's line about the Gulf war, as being about "elections, money, oil and dad". I'd be interested to know what other "lines" or "poems" we think might last, for surely poetry has to be at least partly about the quotable idea, else its no more use than an old headline. Going to Bury for this year's Text Festival - the fourth to take place in this brave Greater Manchester outpost - you're greeted by a neon sign at the station "Poetry has been Bury Bury Good to Me" - which like Lemn Sissay's work in Manchester has the advantage of placing poetry in a public space. Silliman, who attended again this year, highlights the international power of language which the Text festival investigates. Yet its hard to know how much notice Bury took - on reaching the gallery there are protestors outside as coalition cuts have led to the library being scaled back. The result, an empty space that is a new "sculpture gallery" that strips back the beautiful room to its essence, will, I think become a loved triumph over time - yet art/culture have their work cut out when they are placed against being able to pick up a thriller from the local library or borrow some children's books. It is a nice irony that the opening exhibition of "sculpture" is purely made up of words. Laurence Weiner's work has been exhibited in Bury before, and there's a certain contradiction to opening up a sculpture space with what most people wouldn't consider sculptural. Yet it also makes sense, for here the floor is empty - bar a couple of temporary pieces. In this, the paradox of language, that it makes so much happen yet doesn't take up physical room, unlike so much else in the world. Ironically, this weekend saw the hollowness of Morrison's supermarket projecting their "cheap bread offer" on the Angel of the North. Its a crass gesture, but you could possibly argue that Anthony Gormley got there before himself with that empty gesture of contemporary ennui that was his fourth plinth piece "One and Other." Crass exploitation of art is nothing new. The art will survive, however many parodies of the Mona Lisa we've seen. These Weiner pieces do seem to overemphasise our reverence for a certain American conceptualism and this show seems less vital than, say, the current Nauman exhibition in Preston. But in some ways it acts as a frame in which the gallery's other works can be more easily hung. language "polari" in the basement, and "The Language of Lists" as the main show. I enjoyed the redundant typewriters of the "Typing Pool" which enables anyone to participate on these obsolete machines (see my piece above) and the exhibition acts as an opening onto this year's other shows. One of the strengths of the Text Festival is its sense of continuation, both in terms of existing traditions that embraces US conceptualism and L=A=N=G=U=A=G=E poetry, Bob Cobbing's energetic UK cottage industry around "concrete" poetry, and more contemporary movements at the edges of current artistic/literary practice. A debate on Saturday afternoon saw Canadian Derek Beaulieu, another friend of the festival, riff on poetry's invisibility. A poem was projected onto a large building in Canada and it was ignored, just as smaller works are ignored - something about poetry (unlike Morrison's advertisements) creating nothing but indifference. In some way's this is poetry's triumph - that it exists as almost an offcuts tray of language, not at its centre. Yet those of us involved with it see something of interest in that contradiction. The text festival's ability to uncover hidden language and hidden meaning puts an unusually strong light on the work. Perhaps I don't respond to the Weiner only because I prefer my writing to be small, hidden away, read not shared. In Tony Lopez's book about the text festivals, Beaulieu talks about sending an empty box to Bury via UPS, but them refusing to let him do so unless he put something of value (in this case a blank piece of paper valued at 3 cents) in the box. Language's ubiquity makes its value hard to measure it seems. The afternoon saw a series of readings from Knives, Forks and Spoons Press, (who published my first collection "Extracts from Levona"), which had its genesis at a previous festival. I hadn't realised that the humble name came from a desire to write or publish "kitchen sink poetry" (interestingly modest aims compared with the axe wielding Bloodaxe for instance!) Yet the list has grown so that it includes, yes, the confessional work of the originator of that name, Richard Barrett, as well as hand on heart Bobby Parker, but also finds room for Anglo-Welsh poet, Rhys Trimble, the collage/found pieces of Anne Matthews and Tom Jenks, and variously compelling work by Tim Allen, Lucy Harvest Clarke and Debbie Walsh. I wasn't able to stay for the evening's show from conceptual poet Caroline Bergvall or return for the Sunday events as I was going to "Sounds from the Other City." Before my immersion in the sounds of 2004, I caught a number of interesting acts, the febrile Young British Artists who started slow in a mid-afternoon slot but were on fire by the end, echoing Husker Du or At the Drive In; melodic power pop from Happyness, who I assumed were from Canada, but were actually from South London; the Kate Bush/Florence and the Machine channelling (but to my mind, more a retake on late 90s trip hop aritsts like Nicolette/Lamb) Bernard and Edith, and finally PINS, returning to the festival where I first saw them, but now absolutely owning the grand, large stage of the beautiful Peel Hall at Salford University.